Currently I live in Virginia Beach. I have been building models off and on for around 50 some years now. Give or take. 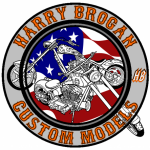 As you can see by the posts of models that I have made I generally build motorcycles. Any scale, it doesn’t matter. Small to large. Favorites would be the Tamiya kits as the engineering in these are far superior to other model companies. I hope that you all enjoy the posts that I make and I’ll be posting more as they become available.